Kriegar Karnivore Assisted Opening Pocket Knife - Two-Tone Copper Titanium Finish with Teeth Marks | BUDK.com - Knives & Swords At The Lowest Prices! 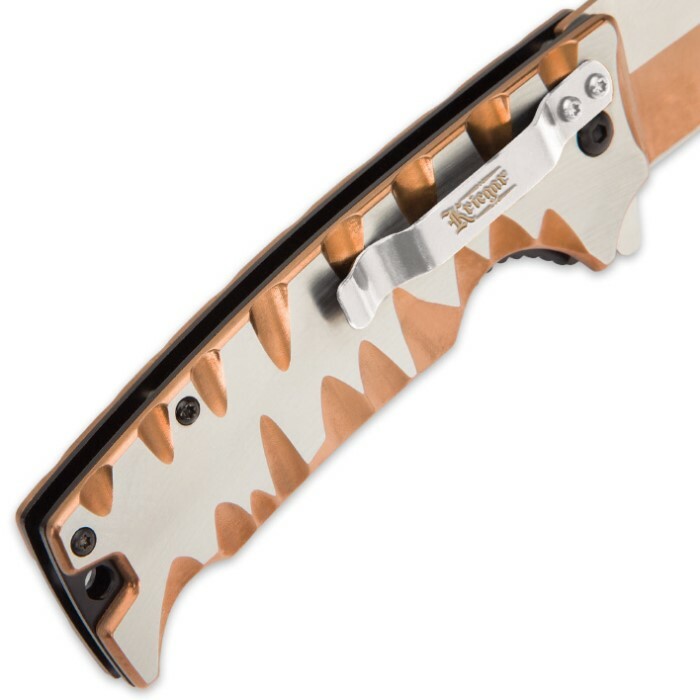 Take one look at the Kriegar Karnivore Pocket Knife and its savagely wild ferocity is immediately apparent. The natural silver-colored stainless steel handle is edged by wicked, otherworldly teeth marks highlighted with a brilliant copper titanium finish. Explore further, and you'll discover this craggy row of canine-shaped indentations is just the beginning. Brandish it once, and you'll see - this menacing folder has a deathly sinister bite to back up all that voracious aesthetic "bark." Exhibit A: the fiercely sharp 3 3/4" stainless steel drop point blade. It's stout, potent and looks incredible, with its distinctive two-tone copper titanium finish and sleek fuller and through-holes. Best of all, the unique blade deploys quicker than a wolf can gnash its teeth, thanks to the lightning fast, silky smooth assisted opening mechanism. 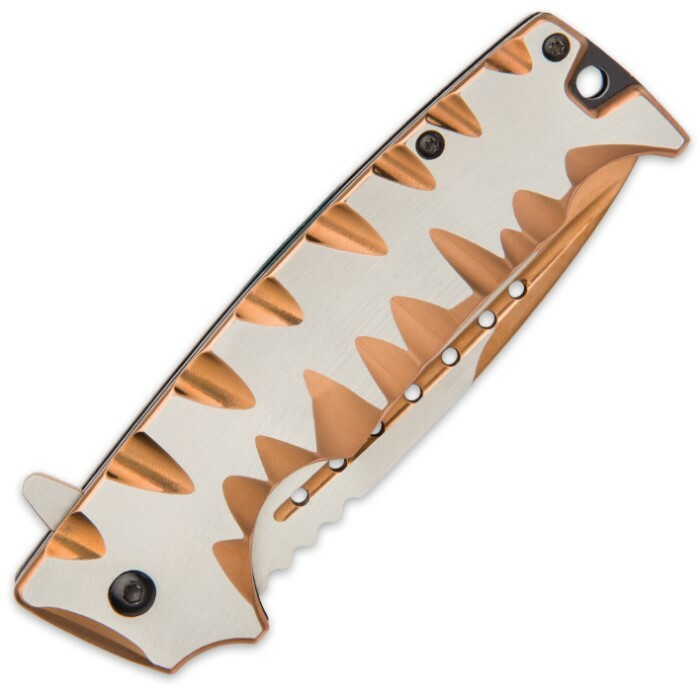 Just pull the flipper, and watch it open in a blur of gleaming copper and steel! Once open, the Karnivore's sturdy liner lock keeps the blade fixed firmly in place for added safety and stability. The Karnivore is weighty and robust, with impeccable balance and hand-feel. It's also easy to transport, thanks to the integrated pocket clip, lanyard hole, and its comfortable 5" closed length. From suburban backyards to remote back country, the Kriegar Karnivore Assisted Opening Pocket Knife makes it easy and fun to bare your teeth. This is a good knife ,at a good price,with fast delivery time. This is a perfect EDC for the leader of the pack! 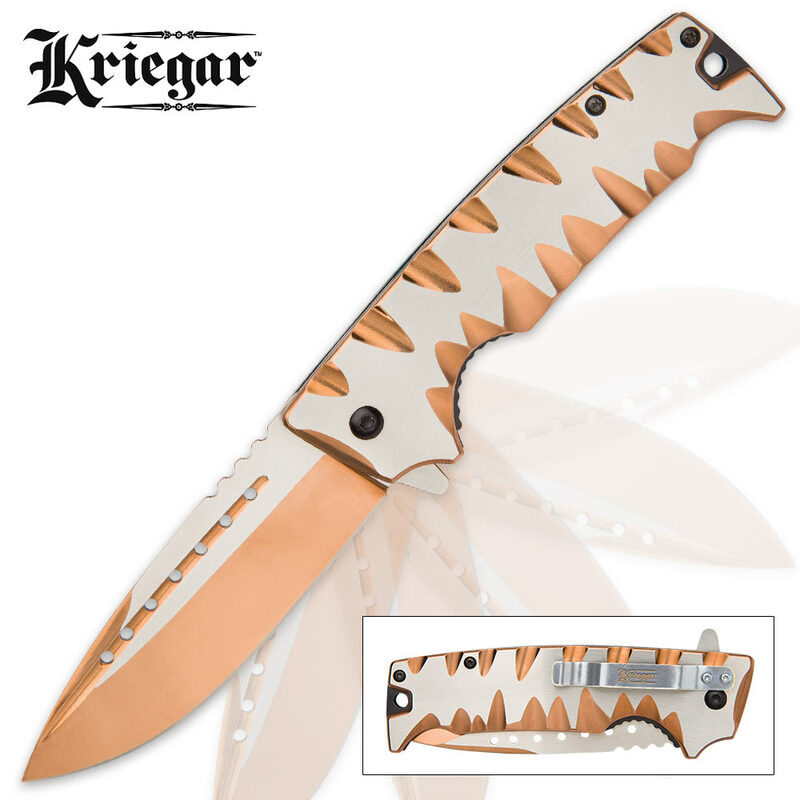 Beautiful and utilitarian, all eyes will be on this blade when you put this Kreiger into action. The action is silky smooth, lightning fast, and breathtaking. The pictures don't do justice to this folder. It will be your favorite blade, perfect for any task, big or small. It is a solid metal knife, but the smooth flip is comfortable, and I always look forward to showing her off when asked the silly question 'do you have a knife? '...I have a Karnivore! !